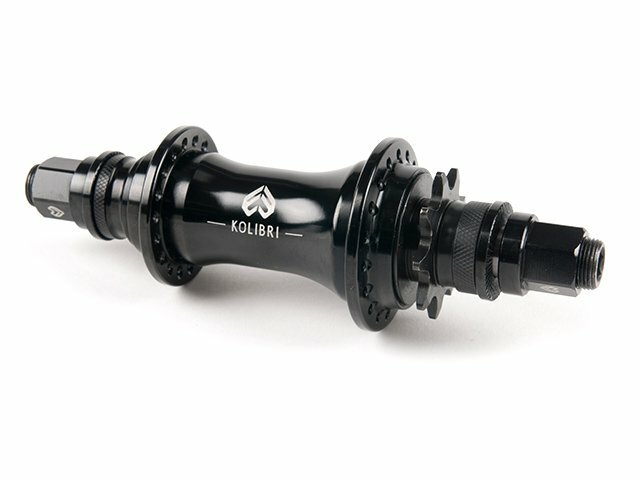 Lovers of optically puristic designed low flange hubs may get with this eclat "Kolibri" Cassette Hub exactly what they expect. The eclat "Kolibri" Cassette Hub is a high quality and very light cassette hub with a 6061-T6 aluminum CNC machined low flange body. As a result the eclat "Kolibri" Cassette Hub adds inconspicuous in the total picture of your bike. The 9T Driver which is equipped with a polymer bushing, a stable 14mm hollow male axle made of heat treated 4130 CrMo and high quality sealed bearings ensure high stability, durability and reliable operation. With the separately available eclat "Kolibri" and "Gong" Rear Hubguards you can protect both flange sides of this Cassette hub.